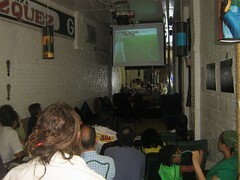 Watching Brazil v. Australia at a (partially) Australian-owned establishment (Smooch, Fort Greene, Brooklyn). Question: can you openly root for Brazil when the people who make your favorite cup of coffee are Australian? How about when they make the cup of iced americano you are enjoying *during* the match? On the upside, 1) Brazil won and 2) Ferentz Lafargue from Nightshift Chronicles showed up during the match and we got to meet. Ferentz is a blogger by night and an English Lit prof at the New School for Social Research by day. See album of this lovely soccer-filled afternoon at Smooch. thanks for visiting. 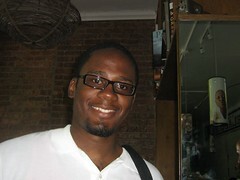 i've added you to my haitian diaspora blogroll to the right of the page. i've also subscrived to your blog. see you soon.